It's so hard to believe that Kate is already 2 months old! 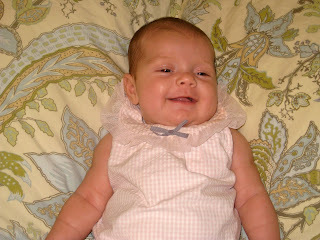 She'll officially be two months tomorrow! 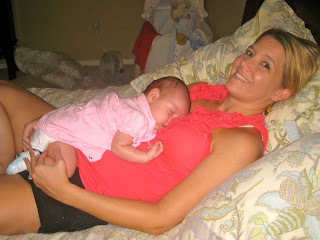 It's amazing how much she's changing and growing. I want time to just stand still...wish the days were longer. We're having the best time with her. About one month ago, she flashed me her first smile and it was so unexpected. 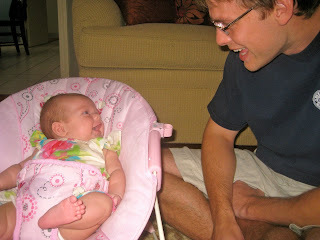 Now, she smiles often and it's becoming more and more reactionary to things that we do, which makes it so much fun! 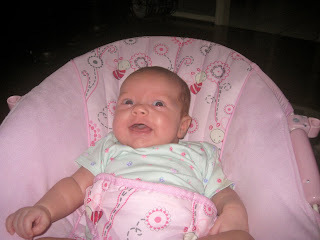 Mom and dad are pretty funny these days ; ) Kate goes to the doctor on Thursday to get all of her vaccinations. My mom is coming in town this weekend as well, and she's been gone for a month now, so she'll just die when she sees how big she has gotten! 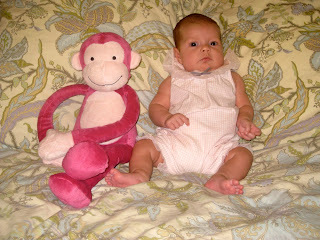 Here's our standard monkey shot so you can see how much she's grown over the last month. There's a great shot of her laughing at her daddy and a shot of she and I just maxing and relaxing that I love. We've mixed in some other shots that we also think are adorable. Enjoy!